I noticed an interesting UDRP filing I want to share with you. 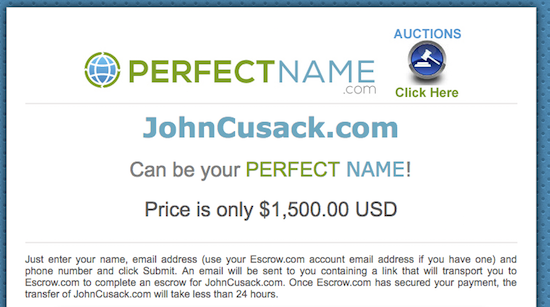 John P. Cusack filed a UDRP against JohnCusack.com. The UDRP was filed at the World Intellectual Property Organization, and it is WIPO Case D2016-1460. The reason I find this interesting is that the filing fee for a UDRP at WIPO is also $1,500. When you add in legal fees (assuming an attorney filed on behalf of the complainant), the cost would appear to be higher than simply buying the domain name. In addition, although it seems like the complainant (assuming it is the actor) has a good shot at winning the UDRP, there is a possibility that the respondent will defend this domain name and has a chance at winning. From a strictly financial perspective, it seems like buying the domain name would make more sense since the cost is likely lower and there isn’t the uncertainty of a UDRP decision. That said, it is possible that the complainant did not click through to the sale landing page to know that the price is $1,500, or the price may have changed since the UDRP filing. It is also possible that the complainant would rather pay for a UDRP filing and legal fees than give money to the domain owner. I suppose we will need to wait and see what transpired and why a UDRP was filed once a decision is rendered. Update: According to UDRPSearch.com, the panel has decided for the complainant. The decision has not yet been posted. Assuming it is the actor who filed this UDRP, why do you think they went the UDRP route rather than just buying the name for the current asking price? Have you visited johnstamos.com since the UDRP transfer? After waiting 20 years, he finally plasters his image on the homepage. Look it’s Stamos standing in bathroom staring at himself in the mirror! Nice report and analysis, Elliot.